Mark Preiss acts as director of the Zion Forever Project, the park’s official nonprofit partner. Preiss served as the founding president/CEO for Glacier National Park Conservancy before returning to Utah. Preiss has served as reserve manager at Ebey’s Landing National Historical Reserve on Whidbey Island, WA, and has worked at the confluence of conservation and culture as the executive director of the Wyoming Outdoor Council, the Historic Fourth Ward School in Nevada, and the literature program coordinator at the Utah Arts Council. He is the recipient of the Historic Preservation award from the State Historic Preservation office in Nevada and Washington and a Tourism Development Award from the state of Nevada. 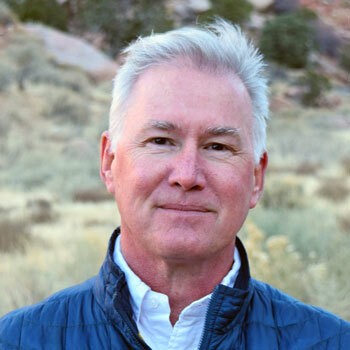 Preiss serves on the board directors of the Public Lands Alliance, where he led the Partnership Best Practices initiative. He is a former outfitter/wrangler in the Teton Wilderness in Wyoming. Mark coaches little league baseball, and his wife, Kathryn, and two boys, Jack at 12 and Finn at 9, love to camp, swim, read and hike.